The video where he shows drawings of how the walking mechanism works needs to be turned into a 3d model so we can start 3d printing our own spider robots. Who is up to this task of awesomeness? That was an uhh… interesting… series of videos. This guy is uhhh.. wow..
though “Amazing” would also be a pretty good fit. That folks, it what happens when a man that lives alone forgets to pick up his Ritalin. It is freaking awesome though. Nah, he’s definitely hooked up with the girl who’s been helping him with the project along the way… She’s in a few of the videos. They have a kid now which I think is the reason he hasn’t been making any more progress on the robot. Hopefully they’ll be able to get back to this soon. He’s a bit of a mad scientist genius. He and the girl featured in the videos have a little daughter together who’s about 1 year old I think. They lived in the UK together and I believe they are now living at the Secret Lair. I didn’t know he was in UK… All the videos up until last year were somewhere in the US. I’ve been following his videos for a long time. He owns land in vermont (I think) where he has a dome building and a girlfriend who is a mother to their daughter. He lives off the grid, and when he needs something (a saw mill, a road) he builds it. Often while wearing 50+ pounds of chain mail. He’s a machine. It gets too cold there to stay there during winters, so he tries to leave for it. This year it was to england. He recently got contracted by a toy maker in the UK to build his robots on a smaller scale (complete with neat weapons and sensors).. he fought hard to not compromise the cool/fun aspects while making it a retail product. The guys at Artisan’s Asylum (a hackerspace in Boston) are also building a giant rideable “spider” robot, named Stompy. They’re funding the project by letting hackerspace users enroll in a “class” to help design and build it. These guys are serious roboticists and come from places like Boston Dynamics (makers of BigDog and PETMAN), Barrett Technology (WAM arm), and DEKA (of segway fame). I..I don’t even. He really did all the things. But also accidentally the whole video. Hopefully my thoughts have been stated in a way that both the readers and he can understand. Bah the embed code removed the playlist. Awesome. Wish I checked back sooner. This guy is impossibly ambitious but he gets it done. Quite an inspiration..though I fear my aspirations are leaning towards madness. Oh man, I remember this guy. It’s so awesome to see someone just deciding to do something completely outlandish (like, I’m going to go live off the grid AND build a giant walking robot) and then actually doing it. He seems like he’s so happy all the time, even when things aren’t going quite right with his projects. If you were thinking about buying a Hexpod for hacking or whatever, don’t. Wait for this one instead and support the inventor! Even that was a modified version of another that I’d found. Nah, I’m just being a jerk on the internet (it’s so much fun). 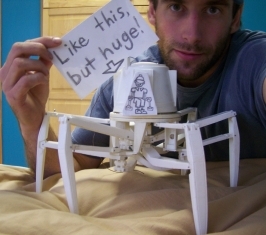 This guy is awesome and so is his “robot”! Just here to comment on the search feature at Hackaday…. it blows. Every time I try to “search” for that great project I know I saw weeks ago, I just can’t find it with your search tool. I’m just say’in. Have you people tried Google’s site search feature? Oh man… we know. We’re working on a solution. I have not had any problems myself but I applaud your blatant honesty. I posted this as a comment by itself, but I just wanted to make sure you knew this, you posted Jamie in your post about his method of 3d printing that involved adding holes everywhere and his method of splitting the bottom layer into pieces so it wouldnt warp as much. Also check out his entirely 3D printed big (as opposed to giant) robot, and the toy version which is actually being manufactured for sale. This is why people with bipolar disorder have a hard time staying on meds. The highs are the greatest! People with bipolar have a flipside. I think Jaimie is like this ALL the time. Jamie is now officially my god and idol. I wish I could be that cool. Try to stay level dude, don’t burn out… and keep your stick on the ice and such. Been watching him since last year, and he hasn’t stopped working on his giant robot because he lost interest in it, he’s been on business trips of late for the toy robot and also because the hanger he was building the robot in, collapsed on it, so the thing holding the hanger up, was the giant robot. Also check out his “Zero to Invention… in 36 years” video. Despite it all, for what I can tell, he’s still in one piece. I’ve seen how guys in the Philippines, entirely out in the bush, make .45s and their operations are precious little more than a drill press (lots and lots of drilling) and files (lots and lots of filing), but even they have vises and C-clamps. Why get a hammer when there’s an electrician’s pliers at hand? His are not the ways of the union sheet-metal workers. Depends on where it breaks, but I’d assume it wouldn’t go too far. It’s going to bind in the log almost instantly. I wouldn’t stand in the plane of rotation though. Please tell me I’m not the only one that just blew a few hours watching the most entertaining videos of their life! this guy should be on tv, id watch it. probable the only thing that i would watch mind! Tip for younger players: Don’t attempt to make structures out of welded aluminium (that you are going to trust your life to) if you can’t already weld steel to a standard that is objectively excellent. Welding Aluminium is MUCH harder to get right than steel. The article you posted this in was his way of 3d printing that involved adding holes everywhere. Consider placing a water drip dribbling water onto the blade just before it enters the cut to help lubricate the blade; I think you’ll find the cut goes smoother and faster. This is what life would be like if Minecraft was a reality.